(Huntsville, AL) – The results are in from the 2016 Alabama Governor’s Conference on Tourism, with the Huntsville/Madison County Convention & Visitors Bureau (CVB) coming out on top, earning the distinction as Alabama Tourism Organization of the Year. The conference, which took place August 20-23 in Orange Beach, AL, brings together tourism professionals from across the state to discuss the economic impact of the industry, share and learn new marketing strategies, raise money for scholarships, and recognize top achievers in the field. Travel and tourism in Madison County is booming, having seen the highest economic impact year ever in 2015, bringing in $1.13 billion and nearly 3 million visitors to this area alone. Much of this impact is due to the hard work of the Convention & Visitors Bureau, whose purpose is to showcase and market the area to both leisure travelers and meeting planners alike. The award was won in part for the CVB’s recent digital marketing efforts, including the iHeartHsv social media campaign and website redesign, which has created a fresh appeal to the more tech-savvy traveler and allows for easier access to information on local attractions, activities, and more. The CVB has also seen great success in the conventions arena, winning internationally significant conferences for Madison County, such as TBEX – the world’s largest travel blogger conference and networking event. 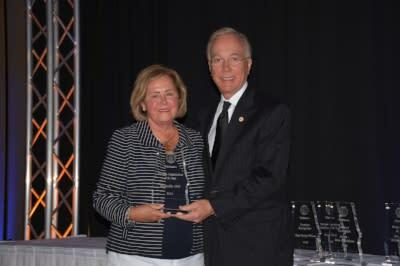 When presented with the award by the Alabama Tourism Department, CVB President/CEO Judy Ryals said, “It is a real honor for the Huntsville/Madison County Convention & Visitors Bureau to be chosen as the Organization of the Year. Our agency works closely with partners throughout our community who are responsible for more than 15,000 jobs.